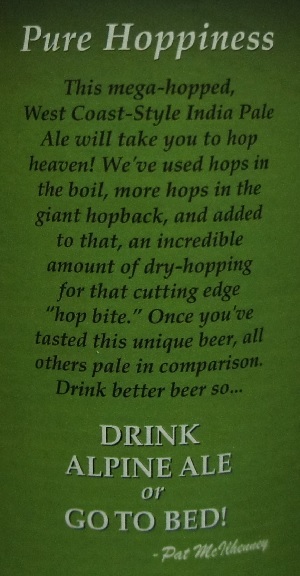 Brewer Description: (from bottle) This mega-hopped, West Coast-Style India Pale Ale will take you to hop heaven! We’ve used hops in the boil, more hops in the giant hopback, and added to that, an incredible amount of dry-hopping for that cutting edge “hop bite.” Onve you’ve tasted this unique beer, all others pale in comparison. 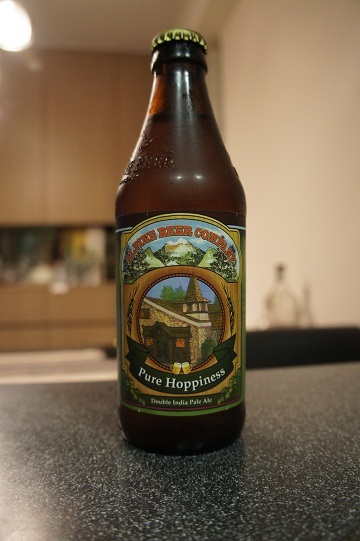 Drink better beer so… drink Alpine Ale or go to bed! Intro: A 12 fl oz bottle with a best by date of 10th May 2016, poured into a Spiegelau IPA glass. Appearance: It poured a slightly hazy orange colour with puffy three finger off white head that had good retention and left lots of nice sticky lacing. Aroma: Citrusy mandarin orange, slightly candied, piney hops and some light tropical fruit. The finish is a very nice strong floral. Taste: Starts lightly sweet with mango and orange. The finish is a strong lasting grapefruit pith bitterness with some light caramel. Overall: A very nice bitter DIPA. Great balance between the malts and hops.